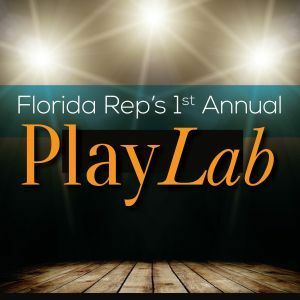 The first weekend in May, Florida Rep held their first ever PlayLab Festival, “an intensive festival that showcases New Plays and New Voices in the American Theatre, and gives playwrights a safe environment to workshop their plays.” Out of approximately 100 plays considered for the festival, only four were chosen to be read. One of these was Daryl Fazio’s Split in Three, which Essential audiences may remember from the 2012 Bare Essentials series. Congratulations, Daryl! One of the plays read during the 2014 Festival will be chosen for production in the 2014-15 season at Florida Rep. This was an important workshop with which to follow up my Essential process. I wrote a new draft right after the Essential reading almost two years ago now, and that’s the version that was chosen (I think they got about 100 submissions; they chose four for the festival) and read in Florida. The response was like nothing I’ve ever experienced, and I now know, with a little more minor tweaking, this script is ready to fly the coop and hit the stage with a full production. Florida Rep is interested–one of their motives of the festival is to choose a play to be produced on their mainstage next spring. They found the overwhelmingly positive audience response and their own feelings about the play to be good reason to consider it. They’ll make a decision soon. But if they decide not to give it a go, I have renewed confidence in SPLIT IN THREE and will start the task of sending it out into the world. Plus, I become a better writer every single time I get to hang out with actors and read my words for a few days. For more information about Daryl Fazio and her work, check out her website. To learn more about the 2014 Bare Essentials Play Reading Series and how you can get involved, click here. New Website! ..& Thank-you to our Supporters!